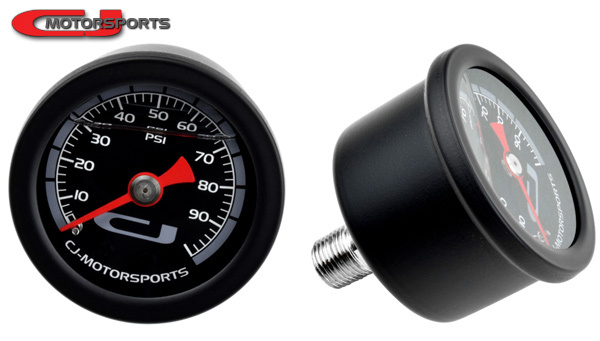 A fuel pressure gauge is necessary for setting an adjustable fuel pressure regulator and also makes for a useful fuel system diagnostics tool. This compact mechanical gauge, with a rear-facing 1/8 NPT thread, is ideal for installation directly in the fuel pressure regulator or other plumbing in the engine compartment. Our custom designed face for this gauge features a prominent 0-100 PSI scale that was intentionally placed away from the bezel to widen the viewing angle compared to other faces available on these gauges. There is a discrete secondary BAR scale around the outside. 3.5 BAR (~51 PSI) is indicated on the straight upward hash mark, which is conveniently the pressure setting to be used on Nissan VQ vehicles when configuring a new return system install for use with an ECU calibration built on the stock fuel system. For any other calibrations, consult your tuner for your proper fuel pressure setting. Case Outside Diameter: 1.6" (40mm). Bezel Outside Diameter: 1.75" (45mm). 1/8" NPT Center Back Connection. Silicone Filled for Vibration Dampening. NOTE: Do not install in close proximity to exhaust components or extreme heat. NOTE: Do not remove or dislodge the rubber plug, it contains the silicone liquid. NOTE: The air bubble in the silicone liquid is intentional.